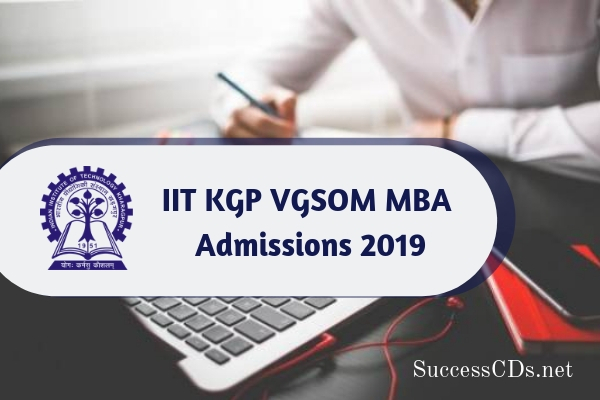 IIT Kharagpur MBA Admissions 2019 - Applications are invited by Vinod Gupta School of Management (VGSOM), Indian Institute of Technology, Kharagpur for admission to 2 years full time Master of Business Administration (MBA) Program for the session 2019. Interested & eligible candidates can apply for VGSOM-IIT Kharagpur MBA Program here, to be eligible to participate in the admission process of VGSOM-IIT Kharagpur. The flagship program of the school leads to the degree of Master of Business Administration from IIT Kharagpur. This is a full-time four-semester (2-year) residential program for graduate engineers and master's degree holder in science, economics, and commerce, intending to pursue management career in India or abroad. The duration of MBA Program is 2 years (4 semesters). Total quantum of coursework required to earn the MBA degree through VGSoM = 89 to 93 credits. However, if selected, the admission of such Applicants to the program will be provisional, only if (s)he submits a certificate latest by May 31, 2019 from the competent authorities of his/her university/college/institute (issued on or before May 31, 2019) stating that the candidate has completed all the requirements for obtaining the bachelor’s degree/equivalent qualification on the date of the issue of the certificate. Applicants belonging to PwD category seeking admission to MBA are required to appear before a medical board on or before October 31, 2019 at IIT Kharagpur. The decision of the Medical Board is final and becomes binding to the candidate. The selection of Applicants for admission to the 2019-2021 batch of MBA at VGSoM, IIT Kharagpur is a two-step process. First, the Applicants who have applied successfully to the program are shortlisted for Written Aptitude Test and Personal Interview (WAT-PI). Secondly, the Applicants who have been selected through the WAT-PI process are offered final admission to MBA on the basis of a cumulative performance score based on application rating and performance in WAT-PI. In the first step, the Applicants who have successfully applied to VGSoM, IIT Kharagpur through proper process and fulfil the minimum academic eligibility criteria are short-listed for WAT-PI on the basis of CAT 2018 score, past academic performance, and other criteria, if applicable, as mentioned below. An applicant belonging to overseas category (non-domestic candidate) is required to apply with a valid GMAT® (Graduate Management Aptitude Test) instead of CAT score, and should have a total scaled score of at least 750 for being considered for shortlisting. The application form must be completed in all respects. Any incomplete form will automatically be rejected from further consideration. Female Applicants will be charged the same level of application fee as paid by male Applicants of respective category. Applicants who would apply to the MBA program of VGSoM, IIT Kharagpur and would be shortlisted for WAT-PI process shall be intimated via email in due course of time. The tentative date of declaration of results for final admission is: 29th April, 2019 (Monday). Applicants would be required to log in to the application portal mentioned in Step 1 to find out the status of their application.